Patricia Lee is a partner of the Firm practicing primarily in business and commercial litigation, including, but not limited to, partnership/shareholder disputes, contract enforcement/defense, non-competition agreements, and commercial lease review and litigation, and family law. In addition, Patricia also practices in the areas of trademark registration and litigation, collections, mechanic’s liens/foreclosures, and medical claims billing. Patricia’s range of experience allows her to manage the legal needs of entrepreneurs and small business owners through the Firm’s program entitled The Legal Solution for Entrepreneurs & Small Businesses. Patricia hails from the small town of Lompoc, California, where she graduated near the top of her class. She attended the University of Southern California and obtained a dual degree in psychology and communications in 1997. During her time at USC, Patricia received several accolades for her academic excellence and dedication to campus and community activism. Among the awards she received were the Thurgood Marshall Leadership Award and Order of Troy for academic achievement. After graduating from USC, Patricia worked for one year as an employee at the California Science Center in Los Angeles, California, and assisted in the establishment of the Rosa Parks Community Computer and Learning Center for inner city youth. She then attended the prestigious George Washington University Law School where she obtained her juris doctorate in 2002. Patricia joined the team of Hutchison & Steffen immediately after her graduation from GWU. Patricia’s dedication to community activism continued at GWU where she was elected as the Community Service Director for the Student Bar Association as well as the Student Director over the Small Business Clinic where she assisted small businesses in economically distressed communities with their legal needs. She also gained valuable legal experience as an intern for the United States Department of Justice, the United States Postal Service, and for a private practitioner focused primarily in employment and labor law, and criminal law. Today, Patricia serves as a volunteer attorney for the Child Advocacy Program where she represents abused and neglected children in Clark County, Nevada. 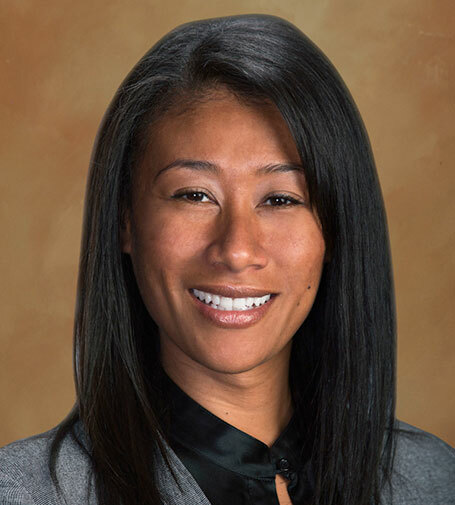 In addition, she previously served as Treasurer of the Las Vegas Chapter of the National Bar Association, and is the current President of the Las Vegas Chapter of the National Bar Association Foundation. In 2010, Patricia was appointed by Governor Gibbons to serve as Chair of the newly-established Nevada Crime Commission. In 2011, Patricia was appointed to serve as a member of the Self Help Center's Steering Committee by Eighth District Court Judge Elizabeth Gonzalez. In 2012, Patricia began serving on the Pro Bono Advisory Council to support the efforts of Legal Aid Center's Pro Bono Project. Also, the Las Vegas business publication In Business Las Vegas honored Patricia with its “Women to Watch 2010” award. When Patricia is not working for the Firm, she enjoys spending time with her husband, Ronnie (a small business owner), and their two children, Brianna and Devin. Patricia also enjoys traveling and reading, and is an avid sports enthusiast. Patricia has litigated a wide spectrum of commercial cases born inside and outside of litigation, including a litany of evidentiary hearings related to preliminary injunctions. Patricia represented a medical provider against a large insurance carrier for, among other things, wrongfully denying numerous medical claims. The trial resulted in a judgment in the client’s favor totaling over one million dollars and more than ten times the amount offered before trial. Convention Center Drug, Inc., et. al. v. NevadaCare, et. al. Case. No. A419252 (Dept. 15, Las Vegas, Nev. 2005). A two-week trial before a three-judge arbitration panel regarding claims by a shareholder against officers and directors of an energy company raising issues of corporate governance, breach of fiduciary duties, and try-out of minority interest resulting in a judgment in favor of clients. Mitchell v. Freeman, et al., Case No. A503996 (Dept. 20, Las Vegas, Nev. 2009). Defense judgment in favor of client at trial involving alleged damages for constructive trust and interference with prospective business advantage and profit. Conte et al. adv. Reed, Case No. A416459 (Dept. 3, Las Vegas, Nev. 2009). After week long evidentiary hearing, successful procurement of preliminary injunction restraining a former executive level employee from illegally competing against her former employer in contravention of her non-competition agreement and subsequently obtaining an order of contempt in violation of the injunction. ESP Wireless Technologies, Inc. v. Fingl, et. al., Case No. A468139 (Dept. 13, Las Vegas, Nev. 2005). Voided rescinded contract on motion for partial summary judgment avoiding multi-million dollar liability exposure for client. Johnson Law Group, P.C., et. al., v. Advanced Client Solutions, LLC, et. al., Case No. A-10-612447-B, Dept. 11, Las Vegas, Nev. 2010). On first day of trial, settled multi-million dollar marital estate in high value divorce action in Nevada Family Court. Sharon D. Lipscomb v. F. Ronald Smith, Case No. D-11-444324-D (Dept. J, Las Vegas, Nev. 2012). Multiple successful trademark registration and renewals with the United States Patent and Trademark office including but not limited to: Michael Godard, Oh My Godard Gallery, Pool Studio, SS Structure Studios, Vizterra, SE3D (with design), SE3D (std. character), Leaf Design, Field Ready, Lunas Construction Clean Up, Lunas Recycling, Gelato Café.